Beautiful Ladies 10k White St. Brigid’s Celtic Cross Pendant available in two sizes. 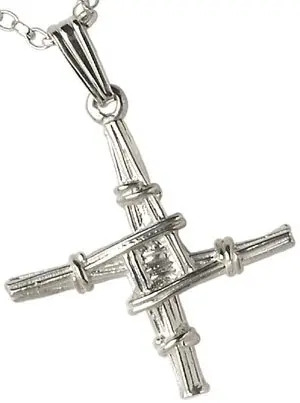 This beautiful 10k white gold traditional Saint Brigid’s Cross necklace is available in two sizes. The smaller is 23mm wide and the larger is 28mm wide – 1 inch is 25.4mm. Handmade double-sided Celtic pendant with 18 inch white gold chain hallmarked at the Irish Assay Office in Dublin Castle with free shipping from Ireland. Also available 14k yellow gold on request.